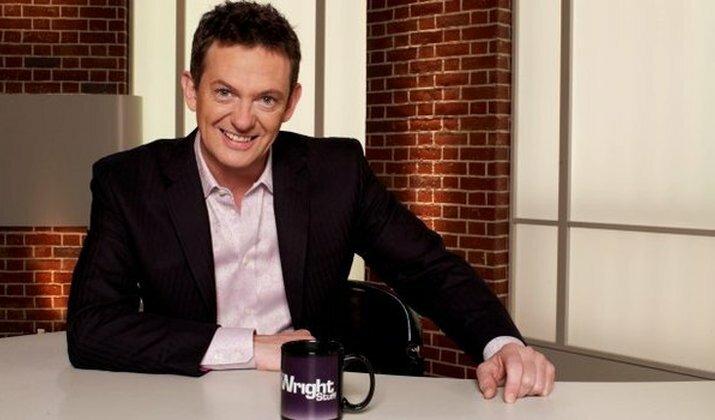 After presenting the lively current affairs show, Matthew presented his last Wright Stuff on 25th June 2018. Matthew would like to thank the panel, the team and the audience members and viewers who made the show the success it was for 18 years. It has been a blast. And that’s pretty much all you’re gonna get from me not just today but for good I’m afraid. What a trip it’s been. Of course the show would never have got off the ground if it hadn’t been for the genius of my first boss Dawn Airey who took a punt and put me on the telly way back in 2000. A little later she encouraged me to let more of my personality come through and that’s when the show really took off. Be naughty she said! Best advice ever. I’d like to thank Kevin Lygo, another former Channel 5 boss, for similarly sage advice and Ben Frow who’s at the controls now. More than that I’d like to thank all the wonderful people who’ve worked on the show not just stars like Amol Rajan but all of you, right down to our newest runner, Aneura. And of course the wright stuff would be nothing without its guests; far, far too many to list but I’m extremely grateful to have ended my run with these three. Thank you anthony, Lowri and Scott. And then I would like to thank you. 18 years some of us have spent together – that’s a long time for stuff to happen. Many of us will have lost friends, relatives. I know I have. You even met a couple of them, Ben Ashworth and Kim Hodge, who we lost to bowel cancer and cystic fibrosis respectively. We won’t forget any of them. And life continues. Babies born when I first came on air are adults now – your horrible sprogs! God i’m gonna miss roasting all you breeders and all you christmas fools, wasting your money on your ungrateful families.haha. Stuff happens. I got divorced – coming in to do a show the day you break up, that’s an experience but then so is coming into do a show when you’ve fallen head-over-heels in love. It’ll be great to see more of Amelia, some compensation for seeing less of you. But then stuff happens. And stuff happens to you. I’ve had thousands of messages from you guys since word of my departure got out and your stories are so touching. How the show helped you cope with depression, loneliness, university, PTSD, having a baby, not having a baby, addiction. I’m so, so grateful you let me know, I really am. I really had no idea how much this all meant to you. I’m still on twitter if you want to stay in touch and I’m sure I’ll pop up somewhere else one day. Until then, thanks for watching, thanks for joining in. Aside from Mrs Wright, the big love of Matthew’s life has been presenting The Wright Stuff for the last 18 years on Channel Five. If you’ve not seen the show before you’re missing out on hearing what the Great British public feels on a myriad of issues from the big political stories of the day to more family-orientated debates, all of it conducted in an atmosphere which is frankly unique on TV these days. Matthew and his small but talented team try to make issues as black and white as possible thus polarising opinion which can make for uplifting and passionate calls from viewers. Matthew says his favourite shows are the ones where viewers phone in a point of view that no one on the celebrity panel, including himself, had considered before. The show, launched in September 2000 gave Matthew an opportunity to combine his journalistic skills with a naturally extrovert personality. Everyone from Tony Blair to George Galloway, Ben Elton to Brian May have appeared over the years generating scores of stories for the press along the way. While other channels dumb down their daytime output, often mocking the very poorest or most unfortunate in society along the way, The Wright Stuff aims to raise the bar and poses seriously challenging moral and ethical dilemmas to viewers every weekday morning from 9.15am.